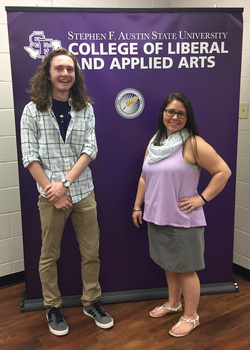 Stephen F. Austin State University's College of Liberal and Applied Arts awarded Travis Fleener, left, with the fall 2018 Research Apprenticeship Program scholarship. The psychology undergraduate student will work alongside Dr. Lauren Brewer, right, assistant professor of psychology, to complete his research on how power and anonymity interact with one another in order to predict online behavior. NACOGDOCHES, Texas - Stephen F. Austin State University's College of Liberal and Applied Arts has announced the recipient of the fall 2018 Research Apprenticeship Program scholarship. The scholarship is awarded each semester to an undergraduate student who completes a substantial research or collaborative project with a faculty member. Travis Fleener, a psychology undergraduate student with a minor in communication, will work with Dr. Lauren Brewer, assistant professor of psychology, to complete his research on how power and anonymity interact in order to predict online behavior. "I hope this research can be successful in educating those involved in these online communities about confrontation and can lead to more enjoyable online experiences," Fleener said. Fleener began working with Brewer as a freshman. This year, the pair decided it was time for Fleener to begin his own research project. "Dr. Brewer will be my faculty facilitator, guiding mentor and voice of reason for this independent study," Fleener said. "She's an amazing person and role model, and her high-energy lab philosophy makes projects like this a blast." Fleener and Brewer will use the scholarship to fund trips to various conferences, specifically the Southwestern Psychological Association conference in April 2019. During these conferences, Fleener will have the opportunity to network, learn and hear feedback regarding his research. "Being able to obtain funding for these conferences can be a challenge, and this scholarship will go a long way in helping me develop as a student and an academician," Fleener said. Brewer, who has partnered with students for myriad research projects, believes it is useful for students to conduct their own research. Working alongside faculty members also allows SFA students to have transformative experiences as an undergraduate student. "It's one thing to read about and memorize the details of research, but it's incredibly enlightening to be involved in the creation of new knowledge," Brewer said. "Joining a research lab helps students understand their chosen field of study in a way that they really can't by reading about it in a textbook." In addition, Brewer said students who get involved in a professor's research lab gain experience that sets them apart. "We want our students to leave SFA and progress to graduate or professional school, or enter the workforce. Joining a professor's research lab affords students the opportunity to fill their résumés with marketable skills and gives them a competitive advantage when entering the workforce," Brewer said. The deadline to apply for the spring 2018 RAP scholarship is Dec. 15. For more information, visit www.sfasu.edu/laa/622.asp.